asked a question before i left for london that asked about the burial place of sir thomas more. we all agreed that he was buried within the chapel of st peter ad vincula, despite the fact that all hallows barking by the tower has listed sir thomas on their website as being buried there. i took a guided tour of the tower (again!) and at the end of the tour the beefeater takes you into the chapel for the final bit of the tour. he speaks a little about the burials that have taken place in the church, including anne boleyn, catherine howard and jane boleyn. he also stated that sir thomas more is buried behind a door which the public does not have access to. no pictures, of course! after the tour was over, i asked the beefeater if sir thomas was really there and told him about the all hallows website claiming to have sir thomas' bones. he said "he is here, would you like me to prove it to you?" i replied "absolutely!" he lead me to a door at the side of the chapel and i walked through. i turned and to my left was the tomb of sir thomas more! i couldn't believe it, i gasped and he asked if i would like to take a picture. here's proof of sir thomas! I thought of another question after I left. Why is his grave out of public view? It's not in the main part of the chapel where the public goes, or would have gone back then. Also, Wiki says he was buried in an unmarked grave. Did they move his body later? It says that all bodies of people beheaded at the tower were buried in a mass grave. If that were true, wouldn't it be hard to identify him? I guess the same goes for Anne Boleyn and Catherine Howard? I know they weren't originally buried where they are today, so were they also buried in a mass unmarked grave making it hard to identify the bodies? It's possible that it is a monument to him, as opposed to a tomb, since it just says "buried in this chapel" on it. I had a tour of Peter ad Vincula and a lot of the guide's information was based on outdated, and now disproved research, but was very interesting nonetheless. More's head is said to be buried in St. Dunstan's Church, Canterbury, Kent, where the Ropers lived. Lara, I had that thought too. The "monument" is certainly big enough to hold a casket, but I had a feeling it's not a casket. If it is just a monument, why wouldn't they say that? They could just say that he's buried in a grave within the church walls, and a monument has been erected to commemorate him. Seems weird to me that he'd be buried out of public view. If they did find his remains in a mass grave later on, they could've re-interred him just like Anne. 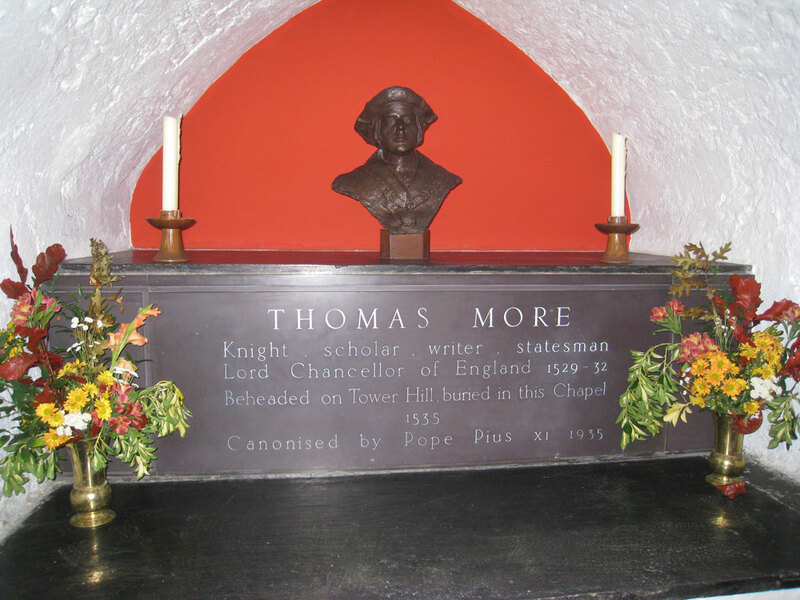 "St. Thomas More's simple and dignified memorial in the crypt of the Chapel Royal was created in 1970, with a fine bust designed and made by Raphael Maklouf." Not much info, but it does call it a memorial. There are some large memorials around that are certainly big enough to hold coffins or remains, but don't, so that in and of itself isn't unusual. The head of Thomas More is indeed in St Dunstan's Church, Canterbury, Kent. It is in the Roper family vault within the church. Its presence there was confirmed in July 1978 when the Canterbury Archaeological Trust and archaeologist Tim Tatton-Brown opened the vault for an archaeological inspection. It is in a lead box tucked into a niche and behind an iron grate in a wall of the crypt. Excavations in the Chapel at the Tower in 1876-77 failed to reveal any bones that could reliably be identified as More's. Not surprising, since a number of men were buried there, all without markers. Short of DNA analysis (obviously unavailable in the 1870s), there was and still is no way to distinguish one headless skeleton from another. As Lara noted, the modern monument to More is simply a memorial, not an actual tomb containing his remains. It is comparable to the many, many memorials seen in Westminster Abbey. Those memorials usually use the term "memorial" or the phrase "In memory of" (rather than "Here lies...") in the text to indicate that the person is not actually buried there. The More memorial at the Tower is notably in the same style as the memorial plaque now embedded in the floor to the left of the main altar in the chapel that notes the burials "nearby" of Jane Grey and others. Sadly, too much of the information available from Yeomen Warders at the Tower today is simply incorrect. But it is important to recall that they are not employed as historians, or even as "museum"-type guides. They do not receive formal training in the legitimate history of the Tower or the events and persons connected to it. Instead, they are trained to tell colorful and entertaining stories, much like a certain horrible Showtime series. The Warders are there to promote (and to guard) the Tower as a tourist destination and to control the crowds, not to educate people in factual history. Treat them exactly as you would that Showtime series ... amusing, fun (for some) to watch, but never a reliable source for factual information. It's sad that the Yeomen don't give the actual history. They do tell entertaining stories, which is what people want to hear. I'm disappointed now, having thought it was an actual grave. I was so excited at the moment that I didn't even question anything. The moment I left I started thinking of things...why was it out of public view, it didn't look like a tomb, etc. Such a disappointment! It's still pretty cool that they let you take a picture of the monument though! I'm still surprised that they let me take a photo of the roses on Anne Boleyn's memorial when I was there in 1998 (on May 19).